Proxy Access: Links to 16 No-Action Requests, TheCorporateCounsel.net. The pace accelerates (search google). Yesterday the count for Rule 14a-8(i)(9) “conflicted” proposals was up to at least 22, not counting other non-(i)(9) attempts at exclusion such as that at AES. Click on the table below to bring into focus and enlarge. Neither supporters nor the press are focusing on the legal issues. It appears the SEC’s no-action letters under Rule 14a-8(i)(9) dramatically shifted in 2004 or 2005 when companies requested them in response to special meeting proposals submitted primarily by John Chevedden and the Steiners. Before that, most of the letters invoking that subdivision involved proposals relating to compensation plans. Companies had a more legitimate argument that proposals governing the same aspects of a plan (pricing options for example) could lead to ambiguous results. As I argued in my appeal (2015-01-13-appeal-of-no-action-on-proxy-access-at-whole-foods-markets), the intended definition of “directly conflicts,” as noted in the no-action letters cited in original adopting release, was limited to very narrow circumstances where adoption of competing proposals could be harmful to shareowners. Additionally, the rule was never intended to allow companies to substitute their own proposals in reaction to those submitted by shareowners. Neither of these issues were substantively addressed in the Whole Foods rebuttal by their outside counsel Baker Botts, in the letters supporting my appeal, or in the news coverage. 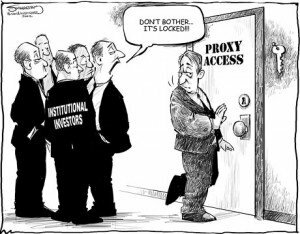 Everyone seems focused on the politics of proxy access and the avalanche of companies now invoking the recent decision regarding Whole Foods. Of course, that is the more dramatic story and people are more often swayed by stories rather than legal arguments. No-action relief is limited to the requester and the specific facts and circumstances set forth in the request. SEC staff has always reserved the right to change the positions reflected in prior no-action letters. Staff should revisit not only their recent decision on Whole Foods but also those issued regarding special meetings and later written consent. They could make their confession easier by saying they relied too heavily on the decisions of predecessors. That seems to be the most popular out in most bureaucracies. Below is the full text of the letter from CII to the SEC. The Council of Institutional Investors (“CII”) is writing to request that the Division’s Staff alter its interpretation of the “counterproposals” basis for exclusion in the Commission’s Rule 14a-8, the shareholder proposal rule (the “Rule”), which CII believes is overly broad and inconsistent with the purpose of the Rule. As well, CII asks that the Staff apply the new approach to open requests for no-action relief and any other requests on which reconsideration is practicable. For well over a half century, the Rule has provided shareholders with an essential tool for expressing their views to management, directors and other shareholders on major policy decisions and other matters that are important to them. This tool is especially important to long- term investors like CII members who, due to their sizable ownership stakes and commitment to passive investment strategies, are unable to exercise the “Wall Street Walk” and simply sell their shares when they are dissatisfied. 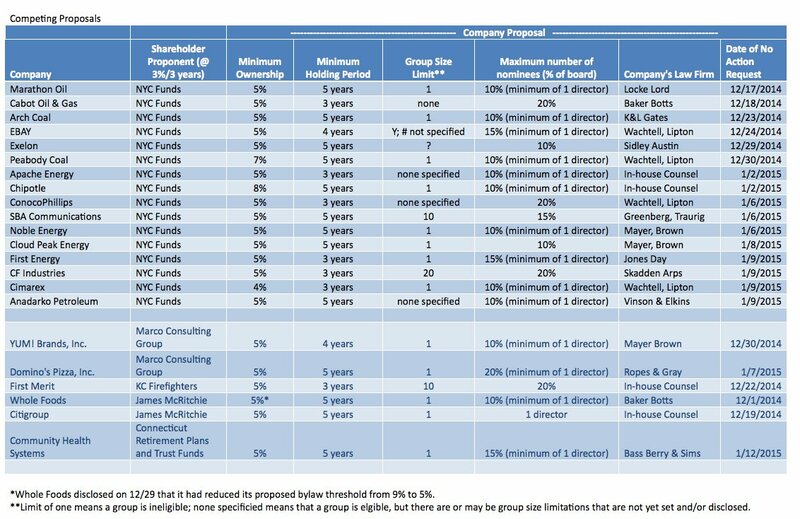 Instead, some of these long-term owners file shareholder proposals to present concerns and encourage reforms, with the goal of improving performance. Shareholder proposals have been an effective tool for changing boardroom practices and motivating important reforms to the U.S. corporate governance model. 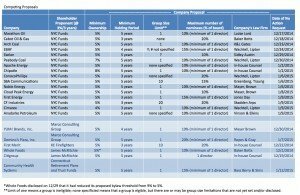 CII has a unique perspective on shareholder proposals. Although the lion’s share of CII’s members do not file shareholder proposals, the small percentage that do represent a substantial proportion of proposals filed by shareholders each year. In 2014, CII members filed an estimated 32 percent of shareholder proposals submitted at U.S. companies. They have done so for many years, with great success. For all of these reasons, CII has a deep interest in ensuring that the Rule is fair and workable for shareholders and companies. The Staff plays a valuable role in the shareholder proposal process, providing its views, upon request, on whether companies are entitled to exclude proposals from their proxy statement. CII appreciates Staff’s careful work analyzing many company no-action requests in a compressed timeframe. CII believes that the Staff’s recent Whole Foods Market (“Whole Foods”) determination (Dec. 1, 2014) has highlighted an interpretive trouble spot. As you know, the proposal that was the subject of Whole Foods’ no-action request (the “Shareholder Access Proposal”) asked the company to adopt a bylaw providing that one or more shareholders with aggregate holdings of 3% of the company’s outstanding common stock for three years may nominate, and have included in the company’s proxy materials and card, up to 20% of open seats or no fewer than two directors for election to Whole Foods’ board. The Shareholder Access Proposal was non- binding, as are the vast majority of shareholder proposals. Whole Foods argued that it was entitled to omit the Shareholder Access Proposal in reliance on Rule 14a-8(i)(9), which permits exclusion of a shareholder proposal that “directly conflicts with one of the company’s own proposals to be submitted to shareholders at the same meeting.” Whole Foods asserted that it intended to put before shareholders at the 2015 annual meeting a binding proposal (the “Management Access Proposal”) to approve a bylaw giving a single holder of 9% of Whole Foods’ outstanding common stock for five years access to the company’s proxy statement to nominate one director candidate. The relevant terms of the Shareholder Access Proposal and Management Access Proposal—the shareholding requirement (including whether a group can aggregate holdings), the holding period and the number of candidates that can be nominated—vary a great deal. Whole Foods argued that allowing shareholders to vote on both proposals would “present alternative and conflicting decisions for the stockholders” and “would create the potential for inconsistent and ambiguous results.” The Staff concurred and provided no-action relief, quoting the above language verbatim in its determination. That determination and reasoning are consistent with a number of previous determinations involving non-binding shareholder proposals on special meeting rights and executive compensation matters. CII believes that exclusion based on two proposals directly conflicting is appropriate in much narrower circumstances than those encompassed by the Staff’s approach. The Commission has stated that a shareholder proposal need not be “identical in scope or focus for the exclusion to be available.” It does not follow from that language, however, that a shareholder proposal is always excludable if a management proposal on the same general reform will be put before shareholders at the next meeting. CII believes conflicting decisions and inconsistent results may occur only in a subset of circumstances where two proposals address the same topic. The most obvious direct conflict would occur if a binding shareholder proposal addressed the same topic as a binding management proposal on the same subject. For example, a binding shareholder proposal to amend the bylaws to add a requirement that the board chair be an independent director would directly conflict with any binding management proposal on the topic of qualifications to serve as a chair, whether the management proposal required an independent chair or mandated that the chair always be the company’s CEO (or any other qualification). The conflict in this case arises from the fact that two bylaw amendments on the same subject cannot occur simultaneously, even though the scope and focus of the proposed amendments differ. In CII’s view, in the context of binding management and non-binding shareholder proposals, identifying a direct conflict requires an examination of not just the subject matter, but also the specific content, of the shareholder proposal. CII believes that a direct conflict, and possible interpretation problems, could occur if a nonbinding shareholder proposal addressed the same subject as a binding management proposal, but suggested reform in the opposite direction. For example, a nonbinding shareholder proposal asking for an independent chair requirement would directly conflict with a binding management proposal to amend the bylaws to require that the chair be the CEO. A company would be hard-pressed to interpret the results if the shareholder proposal and management proposal both passed. Again, here, the scope and focus of the proposals differ, but their varying directionality, for lack of a better term, supports exclusion. Where, as in Whole Foods, a non-binding shareholder proposal and binding management proposal seek the same general direction of reform, but with differing terms, conflicting decisions and inconsistent results are not a danger. Any of the four possible shareholder vote permutations would send a logically consistent message and have clear practical outcomes. A shareholder could vote FOR BOTH proposals to signal that it favors the reform generally, but prefers the terms suggested by the shareholder proposal. If the total votes resulted in both proposals passing, the management proposal, being binding, would take effect and the company’s board and management would know that shareholders preferred the formulation requested in the shareholder proposal. A shareholder could vote AGAINST BOTH proposals to signal that it does not support the reform at all. If the total votes resulted in neither proposal passing, the management proposal would not take effect and the board and management would know that shareholders as a group did not favor the reform in either of the formulations. A shareholder could vote FOR the management proposal and AGAINST the shareholder proposal to signal that it favors the reform but prefers the formulation in management’s proposal. If the total votes resulted in the management proposal passing and the shareholder proposal not passing, the management proposal would take effect and the board and management would have the additional information that that shareholders did not prefer the shareholder proposal formulation. A shareholder could vote AGAINST the management proposal and FOR the shareholder proposal to signal that it favors the reform but not on management’s terms. If the total votes resulted in the management proposal not passing and the shareholder proposal passing, no change would take effect and the board and management would know that shareholders preferred the shareholder formulation enough to vote down the management proposal and wait for a better formulation, whether from management or a shareholder proposal. The Staff’s Whole Foods determination is forcing shareholders into a dilemma in which they have only the Management Access Proposal vote opportunity, but not the opportunity to express a preference on the formulation in the Shareholder Access Proposal. That limitation blunts the communicative value of the vote shareholders do have: If shareholders defeat Whole Foods’ management proposal, it will not be clear to the company if the vote reflects opposition to access generally or opposition to Whole Foods’ much less useful access formulation (and/or possibly to the gamesmanship many observers perceive Whole Foods as having engaged in here). Thus, the Staff’s approach not only curtails shareholders’ ability to suggest different terms for a reform already being proposed by management, frustrating the private ordering that has proved beneficial in the past, it also makes shareholders’ voting decision on the Management Access Proposal unnecessarily fraught. CII views this as a huge loss for shareholders, companies and the markets. CII is confident that the Staff intended neither of these results and urges the Staff to revisit its approach to allow the more nuanced kind of inquiry suggested above. I would be happy to answer any questions, and I would welcome the opportunity to meet to discuss CII’s concerns.